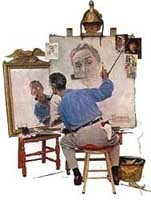 While many people recognize Norman Rockwell as an artist, he considered himself an "illustrator" considering that his paintings were the means by which he fulfilled his commissions for magazines and advertising. Given the fact that original Norman Rockwell oil paintings now sell for sums in excess of $1 million, the facts would seem to be moving toward artist. At the time he painted, the paintings were considered to have little or no value and as such were often simply given away. Some were retained by the ad agencies who commissioned the work, often more by afterthought than by design. Norman Rockwell was born in New York City in 1894, and at the early age of 14 he entered a presigious art school to realize his passion since childhood of becoming an artist. Attending the prestigious National Academy of Design and the Art Students League, he studied with some of the great artists and illustrators of the time such as Thomas Fogarty. By the age of 16, he was earning his first commissions doing cards and illustrations, and he was hired as the art director at Boy's Life Magazine where he developed his lifelong passion for the scouts, later to enter his work in multiple ways. Rockwell executed his commissions by staging a set and specially selected props for his illustration, and then he drew the result. This was a consistent pattern for all of his work from ad work to Saturday Evening Post covers, considered by Rockwell to be the "greatest show window in America, "for which he is most famous. Eventually, his work would appear on the covers of 321 editions of the Saturday Evening Post. His early work was done almost totally in the presence of the physical set, while later in life he used photography to capture the settings, and then he worked from the photos. 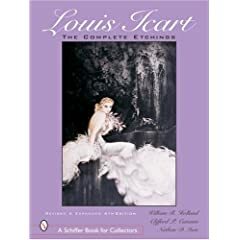 He usually began his work with a pencil or charcoal drawing to capture the basic lines and forms, sometimes followed by studies in oil during which he experimented with alternatives he was considering. Only then did Rockwell begin the final oil painting. By all accounts, Norman Rockwell loved to paint, and he painted whether for a commission he had secured or simply for his own enjoyment. 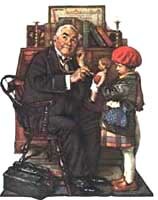 Most Rockwell paintings were also translated into a finite number of signed and numbered lithographs. Most Rockwell lithographs were produced by either Ettinger, Abrams, or Circle Fine Art, and all bear pencil signatures and edition numbers. While this is not true of all works, most Rockwell paintings were printed in editions of 200, with 65 artist proof lithographs on "arches" paper and the remainder on paper with full margins around the perimeter of the work. 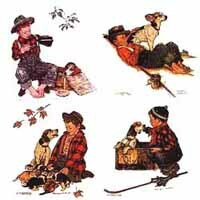 Rockwell prints were produced as both lithographs and as lesser known collotypes, using a slightly different printing technique and a different kind of coated paper. While best known for his Saturday Evening Post covers, Rockwell was also well known for other work such as his boy scout prints. Many American families used dinnerware during and after his lifetime that bore classic Rockwell images, and inexpensive prints were produced in large numbers. The Norman Rockwell museum in Stockbridge, Massashusetts has one of the world's finest collection of Rockwell paintings, left to the museum by Norman Rockwell upon his death at home in Stockbridge in 1978. Buy finer art, prints, and needlepoint on the Collectics Fine Antiques and Art pages, or use our convenient Search Engine! Sell or consign authentic Norman Rockwell, Maxfield Parrish, Currier & Ives, and other finer lithographs at Collectics, where we earn our customers' trust everyday! Read about our top performing national consignment program for estate and personal collections.